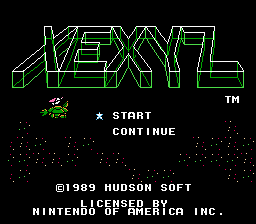 Xexyz (pronounced “zeks-iz”) unfortunately bears one of the worst titles in the NES library. Publisher Hudson Soft apparently didn’t know that most consumers won’t buy a game with a title they can’t pronounce. 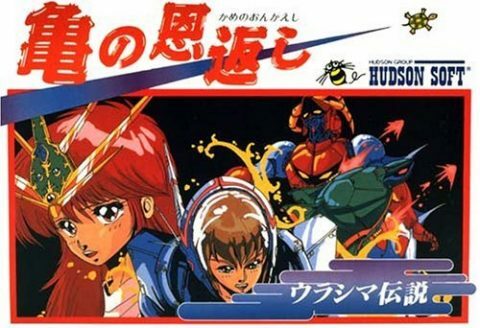 If the title didn’t keep them away, the uninspired box art and tagline (“The Space Action Adventure”) likely moved gamers towards more recognizable hits like Ninja Gaiden II or Castlevania III. 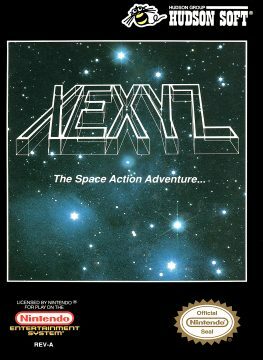 Despite the lack of thought given to the title, Xexyz remains an underrated cult classic for the NES. Developer Atlus nimbly combines platforming, non-linear exploration, and shoot-em-up for a wholly unique adventure. You play as Apollo, a chibi battle-soldier for the five islands known as Xexyz Nation. Xexyz has been invaded by the evil Goruza and his minions. Rather than enslave the people and call it a conquer, they’ve installed Mechanic Castles on each of the islands and taken each island’s queen hostage. With Apollo’s diverse weaponry and magic powers, you’ll take back Xexyz from Goruza and restore the queens to their rightful thrones. 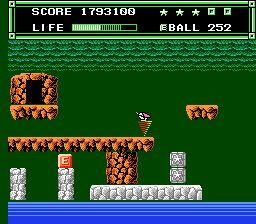 Xexyz‘s odd-numbered stages involve exploring the island and Mechanic Castle, with only a pinch of shoot-em-up inserted into the castle areas. 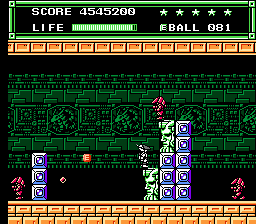 The even-numbered stages, however, are pure shoot-em-up and occur after you’ve beaten the castle boss. Each island has a name like Island of Forest or Island of Volcano, which gives you an idea of the surroundings. The islands all have what you’d expect from a platformer circa 1990 – precariously placed platforms, enemies everywhere, bottomless pits – save for the mysterious open doorways, which litter every island. 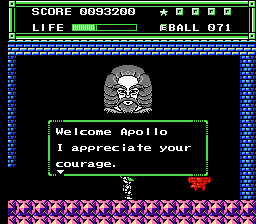 These doorways lead Apollo into rooms that contain everything from plot points, weapon shops, and mini battles where you rescue bathing women from levitating demon heads (!). 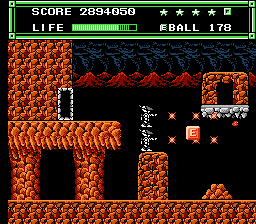 Though one could argue that they interfere with the game’s flow, these rooms give Xexyz a distinct character, more akin to an adventure game than a platformer. 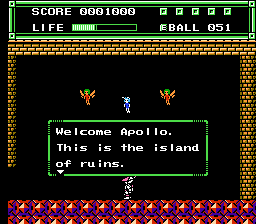 Apollo starts off each island with a short-range hand beam, which he can shoot up and across. This weapon is awful, but thankfully, most islands have rooms that provide a free new weapon to use throughout the stage. 45B Balls shoot out at 45 degree angles and must be aimed precisely at the enemy to hit them. Wave Balls go through objects and are a tad steadier than the 45B Balls. Moon Balls provide a ball shield that circles Apollo, along with a string of highly effective tiny shots. 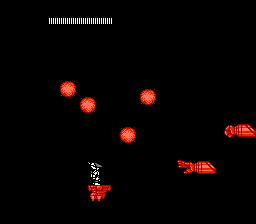 Lasers are the strongest, have the longest range and are the last weapon you acquire towards the end of the game. Magic items can also be acquired from rooms on the island and, while not essential, they do make your adventure more bearable. The Foot Wing lets you jump extra high and glide on the air by continuously pressing ‘A.’ The Typhoon surrounds Apollo in a tornado, where he’s invincible for exactly eight seconds. The Mirror clones Apollo on top of himself, so he can double his attack. 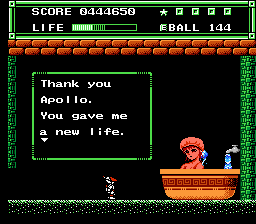 As Apollo slaughters Goruza’s cronies, you’ll notice they drop energy balls. This is your currency. 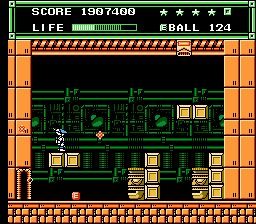 Each ball is worth 1, while the larger energy boxes are worth 5. 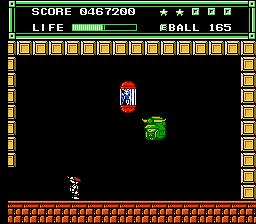 There are several areas where you can gamble your e-balls to win extra money or, in a strange mini-game, hit a ghost towards one of four treasure chests on the ceiling. 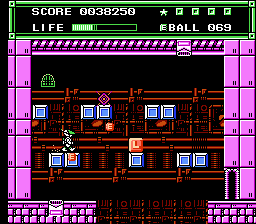 Balls can also be used to purchase lifebar refills or weapons and/or magic items. Once you enter the Mechanic Castle, Xexyz embraces non-linear exploration. None of the castles have particularly large layouts, but there is a sense that you could get lost if you don’t pay attention. 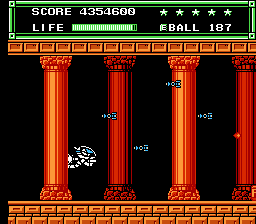 Innocuous air vents on both the ceiling and the ground transport you between different levels of the castle. 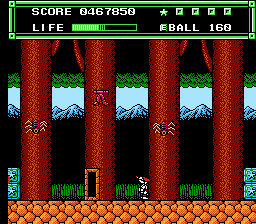 There are also different enemies than those on the island, along with doors that lead to shops in case you need a more powerful weapon. 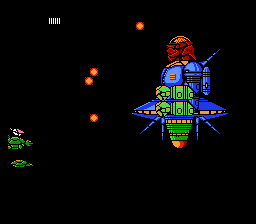 Eventually, you’ll reach a hangar in the castle where you’re given one of four Mobile Armors (fancy slang for a spaceship). 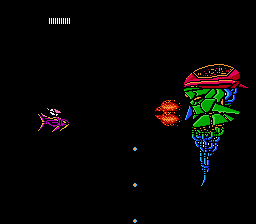 Here, Xexyz turns into a shoot-em-up. These portions are short and not particularly difficult if you’re adept with the genre, but still a nice break from platforming. ‘S’ and ‘P’ power-ups increase your speed and weapon power respectively. Each portion is divided by two doors, located at the bottom and top of the stage. Pick the correct door and you’ll move forward, but choose wrongly and you’ll have to play the section over again. 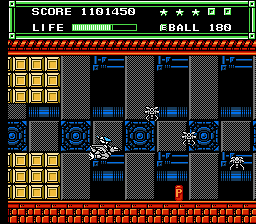 Once you land your Mobile Armor, you explore a bit more of the castle before eventually finding a boss room. 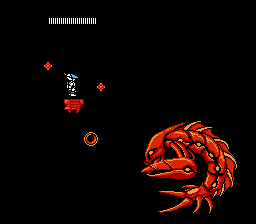 Hop on a levitating platform, the screen will turn black, and the boss – usually a metallic sea creature or dinosaur of some sort with names like Shelza and Loboza – appears firing high-speed attack patterns at you. 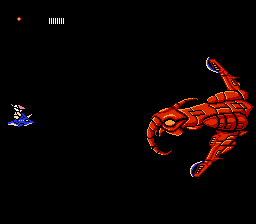 Again, if you’ve played lots of shoot-em-ups, these bosses aren’t very difficult. Those unfamiliar with the genre might have some trouble with the patterns, though. 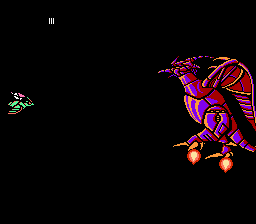 Once you’ve slain the boss, the queen then gives you a Cyborg Rider (ships that usually resemble the boss creature you just killed) to escape to the next island. 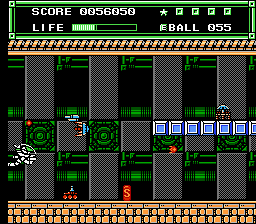 These ‘getaway’ stages are also shoot-em-up areas, though they’re structured a little differently than the castle’s. They’re longer, not divided by doors, and take place outside so there’s more room to maneuver. The last half of these areas automatically increase your speed, while also inserting platforms and enemies that you have to avoid. 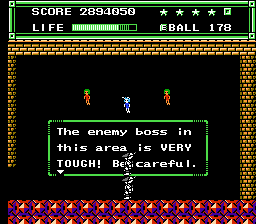 Make it through, and you’re greeted with yet another boss. Kill them, and you’ll be brought to a new island. 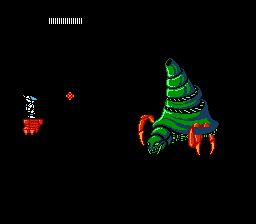 Once you destroy the ten bosses, rescue the five queens, and beat Goruza, you take on the Goruza Castle itself, a large floating structure with a delicate eye in its center. 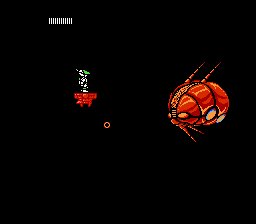 Your ship has a cursor – a first for any Xexyz battle – that must be fired precisely into the eye, or it won’t hit. With a steady stream of bullets that spew towards you from around the eye and a fixed camera angle placed behind your ship, limiting your movement, the Castle is your hardest battle yet. 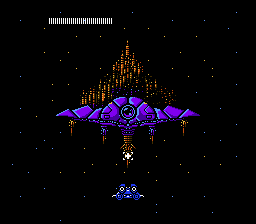 What makes Xexyz much more than the sum of its parts is the seamless blending of all its elements; Atlus didn’t just mesh a shoot-em-up with a platformer and call it a day. 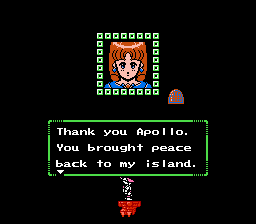 With all of its doors, crazy cast of helpful characters, and abundance of enemies, the islands really do feel like lived-in worlds that are under attack by an invading alien force. The castles also reflect the enemy. They’re cold and sterile and must be navigated in a precise manner, lest you get lost and confused. Traveling further into the castle requires a ship, but you don’t just magically appear in the ship. 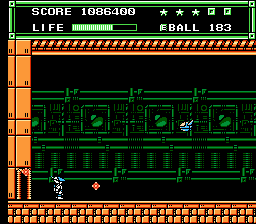 You enter a hangar, jump in, fly through the castle, enter another hangar, jump out of the ship, and move further. Some might call this a needless detail, but it fits with the game’s thorough execution. 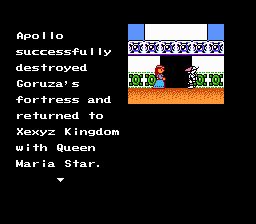 Once you destroy the boss of the castle, your escape – another ship – is provided by the queen. You journey to the next island, fight legions of enemies and another boss before you finally arrive and do it all over again. 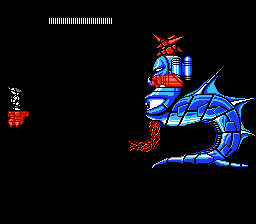 The sequence of the game’s stages flows beautifully together. That Xexyz‘s structure holds up at all is even more amazing, considering the Japanese version has an entirely different story. 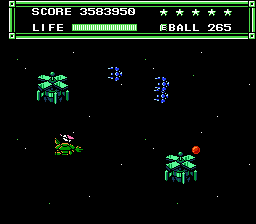 In Japan, the game is known as Kame no Ongaeshi: Urashima Densetsu or Turtle’s Gratitude: Legend of Urashima. 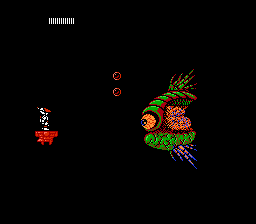 Rather than island nations and invading alien forces, the game uses the Japanese folk tale of Urashima Tarō as a foundation. 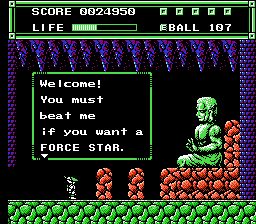 You play as Ken Urashima who has just rescued a turtle from being destroyed by a crab. 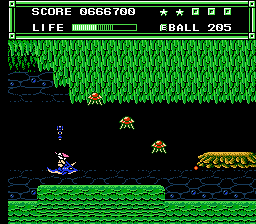 For your heroic efforts, you’re recruited by the turtle to save the Dragon Kingdom (a.k.a. the Xexyz Nation) from the Machine Beast Empire (a.k.a. Goruza and his minions). 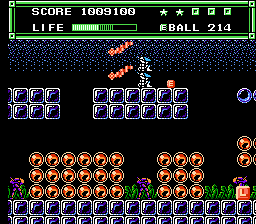 All the weapons/magic are named after marine creatures: the Wave Ball is the Jellyfish Ball, the Mirror is the Bivalve Mirror, etc. All of the ships you use are turtle ships, rather than different marine animals. 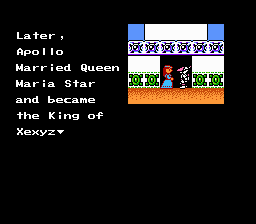 There are also special cutscenes you receive after you beat a boss that involve the queen dancing with a group of turtles, as queens are wont to do, as well as three different endings depending on what you do with the treasure chest at the end of the game. 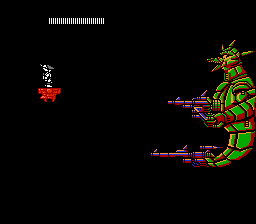 Shame on Hudson Soft/Atlus for taking those scenes out for Xexyz. Special shoutout to the superb music composed by Hirohiko Takayama. 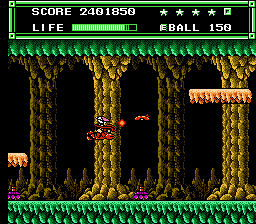 Like all great NES soundtracks, the evocative, melancholy music both captures the intense mood of your adventure and seamlessly blends into the background.